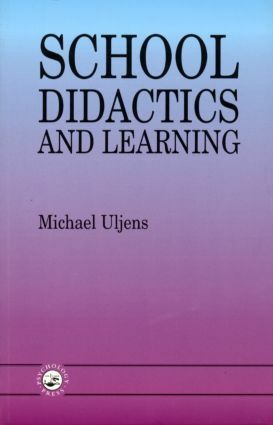 In this book a new theory on instruction is presented - a reflective theory of school didactics - uniquely incorporating continental German and Nordic research traditions in the theory of didactics (Didaktik), together with Anglo-American research on teaching (instructional research) and cognitivist theory. School didactics is defined as a field of research within general education. This field is limited to research and theory aiming at understanding the pedagogical practice which takes place in institutionalized educational settings guided by a curriculum collectively agreed upon. As the theory is designed to be valid for institutionalized education framed by a politically accepted curriculum, it is a culturally seen regional theory of education, not a universal one. According to this school theory the fundamental features of an institutionalized pedagogical process consist in the intentional, interactional, teaching-studying-learning process that is culturally and historically developed and situated. However, the present model does not explicitly formulate goals nor the means of educational practice. Rather, the model emphasizes the teacher and student as reflective and intentional subjects where the teacher is acting as the representative of the collective but also as the learners' advocate. Because of this the theory presented is not a normative or prescriptive theory, instead it is a reflective theory. Part 1 Towards a model of school didactics. Part 2 School didactics and pedagogical implications of learning theory. Part 3 Discussion.